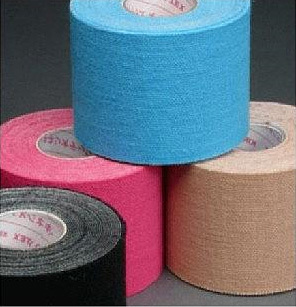 Overview: kinesiology tape. Synthetic fibers are stronger and hold up better under extreme conditions, providing more support and enhanced pain relief. Pro's patented SecondSkin adhesive keeps applications on for up to a week, through even the most intense workouts and extreme conditions. SecondSkin is made from a latex-free, medical grade acrylic adhesive that doesn't irritate skin like regular tape or supports do. Because synthetic fibers are naturally antimicrobial, Pro remains odor and irritation free, no matter how long you wear it.